Advanced Visualizer from Alias/Wavefront is an integrated workstation-based 3D animation system that offers a comprehensive set of tools for 3D modeling, animation, rendering, image composition, and video output. Geometric, analysis, and motion data importation from a wide range of CAD, dynamics and structural systems. Automatic object simplification and switching tools for working with ultra-large production data sets. Motion for an unlimited number of objects, cameras, and lights with Wavefront SmartCurve editing techique. Software rotoscoping for matching computer animation with live action background footage. Realistic imaging effects, including soft shadows, reflection, refraction, textures, and displacememt maps, using Wavefront's fast hybrid scanline/raytracing renderer. Interactive image layering and output to video with Wavefront's new Recording Composer. Powerful scripting and customization tools, open file formats, and user-defined interfaces. 41.8% Material shading of polygonal animation model with highest interactive image fidelity and perspective projection. 28.5% Wireframe rendering of polygonal animation model with perspective projection. 10.45% Material shading of polygonal animation model with lowest interactive image fidelity and perspective projection. 9.5% Smooth shading of polygonal animation model with perspective projection. 4.75% Flat shading of polygonal animation model with perspective projection. 2.2% Material shading of polygonal animation model with highest interactive image fidelity and orthogonal projection. 1.5% Wireframe rendering of polygonal animation model with orthogonal projection. 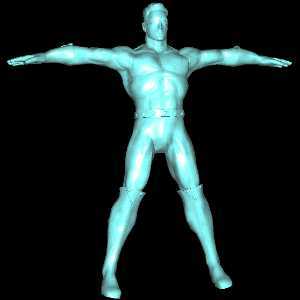 .55% Material shading of polygonal animation model with lowest interactive image fidelity and orthogonal projection. .5% Smooth shading of polygonal animation model with orthogonal projection. .25% Flat shading of polygonal animation model with orthogonal projection.